Door Chain Security Lock. Door chain. Security chain. - The slide catch is mounted on the door with the opening for the chain away from the door edge. - The chain receiver is screwed to the casing, 2"-2 1/2" away from the door jamb (50-57 mm). If the chain is not long enough you can "stretch it" by mounting the slide catch vertically instead of horizontally. - Always store the chain when not in use. 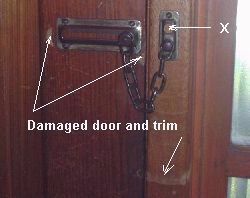 A loose chain will damage the door and door frame, see photo lower left. - The door chain is an excellent security feature but it is recommended to install a door alarm as well. # 6, #8 or #10 Screws? Screw size is determined by the size of counter sunk holes in door chain hardware. A #10 screw head may be too large and will make for a sloppy installation. A #8 or #6 will most likely do the job. You may have to buy chrome or brass screws to match the colour of the door chain. A door chain allows the homeowner to open the door only a few inches. Enough to see who is calling but not enough for an outsider to reach in. It would be better to observe the caller from a peephole or window before opening the door. Even though a door chain lock is a nifty device that has been around "for ever" it is highly recommended to install a door alarm as well. The door alarm should be activated before retiring in the evening or when working in the backyard. If a burglar would pick the door lock, the door alarm will sound as soon as the door is opened and the door chain will prevent the door from opening all the way. To bypass a door chain, the door chain must be snapped or cut. For this reason, door chains are usually made of durable metal like brass or steel. Security chain locks usually come with a satin-chrome or polished brass finish. The door security chain lock is usually installed about 12" (30 cm) above the the deadbolt. NOTE: This distance is shown less in the picture which is for illustrative purposes only. The security chain should be installed on the door casing 2" to 2/14" (50-57 mm) from the door jamb. Door chains come in a variety of styles and are easy to install. Some door chains are sold with 3/4" (19 mm) installation screws which are inadequate, they are too short. The slide catch of the chain lock is fastened to the door with screws that should be slightly shorter than the thickness of the door. The security chain is fastened to the door casing or wall with 2 1/2" (63 mm) long screws. They have to be that long because they have to go through the door casing (also called door trim), plaster or drywall and into the wall framing. In order to reach the framing member the chain receiver should be installed on the casing as far as possible away from the door edge. Do not install the chain receiver as close as possible to the door edge, as many sources are suggesting. If you do that the chain receiver would be fastened through the casing and into the door jamb or even worse, just to the casing and the screw would end up in the space between the door jamb and wall framing, see photo top right. 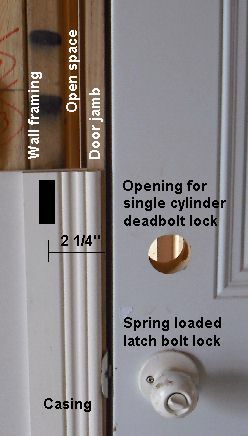 Photo bottom right shows the typical installation of a chain lock for a door with side light. In this case the chain receiver can be fastened in the centre of the moulding as there is approximately 1 1/2" of solid wood behind the casing (3/4" door jamb + 3/4" window frame). It also shows the damage caused by the chain that was never properly stored when not in use. framing can be anywhere between 1/4" and 3/4"